In my lifetime, I've never seen a better time to buy gold than right now. It’s not just because of the numerous risks embedded in the financial system today. It’s because gold is actually cheaper than it has ever been. There are many ways to value an asset, but all those methods are subject to inflation. If you don’t take inflation into account, you’re only reading one ingredient on the back of that food label. Here’s a perfect example of why it’s important to account for inflation. My favorite carton of ice cream sells for the same price as it did five years ago. But the manufacturer made the carton smaller. Is my ice cream really the same price? I get less ice cream than I used to! That’s inflation. And in most cases inflation is hidden, just like the price on that carton of ice cream. However, there’s a trick to adjusting for inflation, especially the longer the time horizon. And the trick is this: inflation measurements have been changed numerous times over the years. The methodology used to calculate the Consumer Price Index (CPI) has undergone at least 14 alterations since 1980. If the yardstick used to account for inflation has been modified that many times, how accurate can that yardstick be on a long-term basis? I asked John Williams of ShadowStats to give me a more apples-to-apples inflation adjustment for gold. Essentially, John inflation-adjusted the price of gold using the 1980 CPI formula. 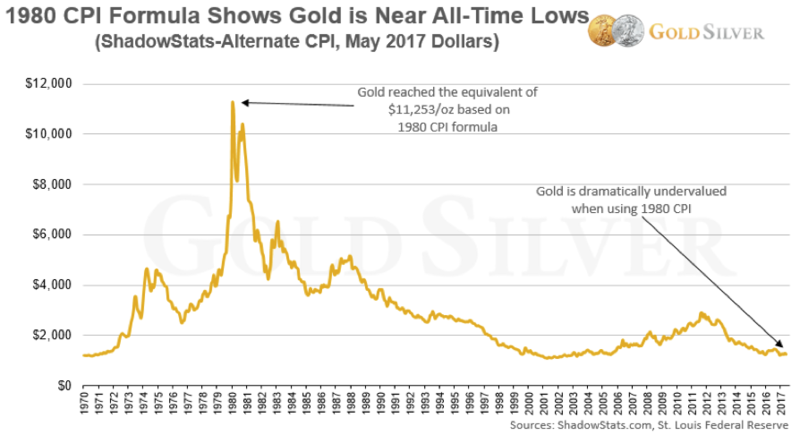 If we use the 1980 formula to measure inflation—the year gold peaked—you can see the current price is near all-time inflation-adjusted lows. In fact, gold is selling at roughly the same level as the early 1970s, when it was illegal to own in the US! You can also see that the inflation-adjusted high would be a whopping $11,253 per ounce. Gold may or may not get to 5 figures, but this shows it certainly could if it repeated the performance from the 1970s. This data tells us that not only is gold dramatically undervalued at current prices, but the potential upside is enormous. If the gold price were to match the return from the past mania, it would have to rise 9 times from current levels! This paints a completely different picture than looking at the government-tinkered CPI. The current formula grossly dilutes how much inflation has really occurred over the past 37 years. It's so misleading, in fact, that it could easily lead investors to make flawed decisions, including whether to buy gold. So, if you plan to hold gold long-term—i.e., until the wealth transfer is complete—waiting to buy may not be in your best interests. Any minor difference in price now will make little difference then. The bigger concerns at that point will likely be how many ounces you own and where they’re stored. But what if you buy now and the gold price does fall? All I can tell you is Mike and I and everyone else will be backing up the truck. But since there’s no certainty that that will happen, we continue to buy regularly. We have protection in place now in case whatever crisis may come pushes gold higher, not lower. If you wait to buy, your risk is that gold and silver take off without you. Then what will you do? If prices do tumble, you might feel smart for waiting, but in the meantime you’re without any insurance. Which risk are you more comfortable with? Also, don’t forget that premiums tend to spike when prices do, regardless of direction. In late 2008, Mike and I saw some dealers charge as much as 90% over spot for silver Eagles! We’ll see premiums like that again when demand spikes. In contrast, current premiums are low. I personally don’t worry about what “might” happen to the gold price. I continue to accumulate now because current prices represent tremendous value… the amount of protection relative to the degree of risk in the markets dictates I be overweight physical metal… and the potential upside from current prices is tremendous. I hope you’ll join us. Here’s what we’re buying now. Here are the latest updates on some of the themes we’ve covered in the newsletter (click on the link to read the original article). • The World Gold Council and Metals Focus issued a report on the coming supply crunch, saying that since 2012, capital expenditures (money spend on exploration and development of new mines) for companies in GDX (Gold Miners ETF) fell by a whopping 65%. As we said in our original article, if you spend less money looking for gold, you’re gonna find less gold. There’s no escaping a major decline in mine production over the next 5-10 years. This will inevitably squeeze new supply and push prices higher.